SaaS companies are the darlings of the public market. The average publicly traded SaaS company enjoys twice as strong a revenue multiple as ten years ago. 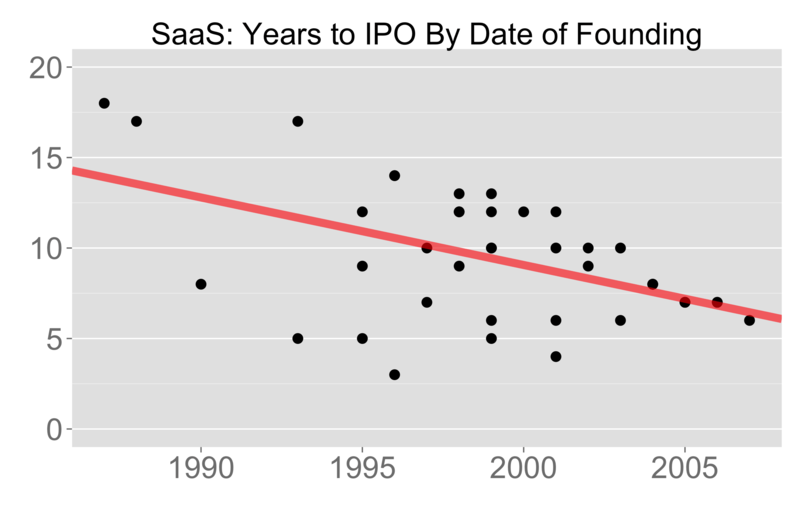 SaaS companies’ time to IPO has been decreasing steadily from over 10 years since founding to under 7. Despite the decrease in time to IPO, the average dollars raised at IPO has tripled from the early nineties and grown by 50% since 2000. 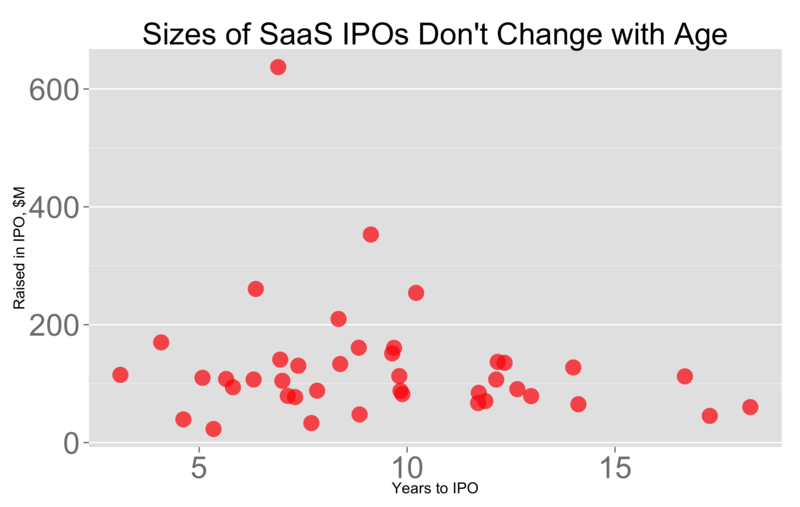 I analyzed the 41 publicly traded SaaS companies comparing to understand the trends in SaaS IPO. The data set is here. Here are four charts depicting the trends. 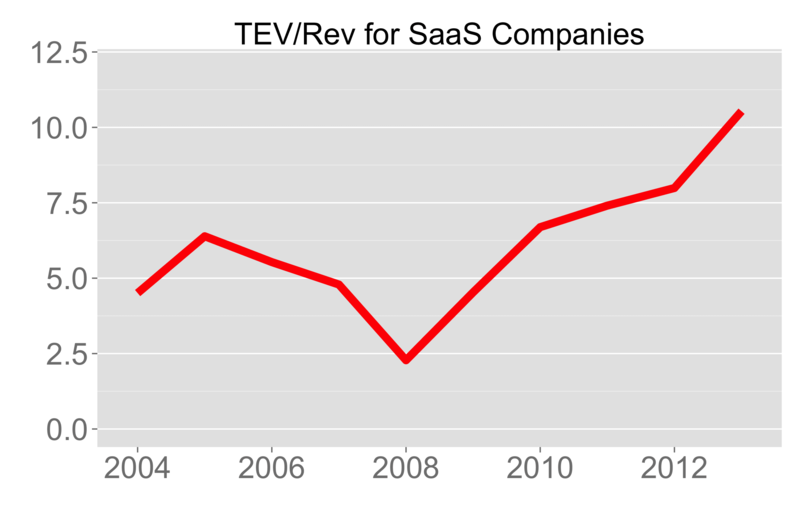 The average SaaS company trades at a 11x enterprise value to revenue multiple, up from 6x in 2006. It’s impossible to ascribe this multiple expansion to a single cause. It could be the growth rates of the companies in this basket, the relative attractiveness of this category compared to other stocks, a better comprehension of the value of these companies by public market investors, or the opposite! In any case, valuations for SaaS companies in the public market are at ten-year highs. The time commitment required to become a publicly traded company has decreased by third from about 12 years in 1995 to about 7 today. Some of this downward pressure on time-to-IPO may be because a company founded in 2008 needing ten years to go public hasn’t had the chance to appear in the data set. To improve this analysis, it would be useful to look at the 2014 IPO pipeline. 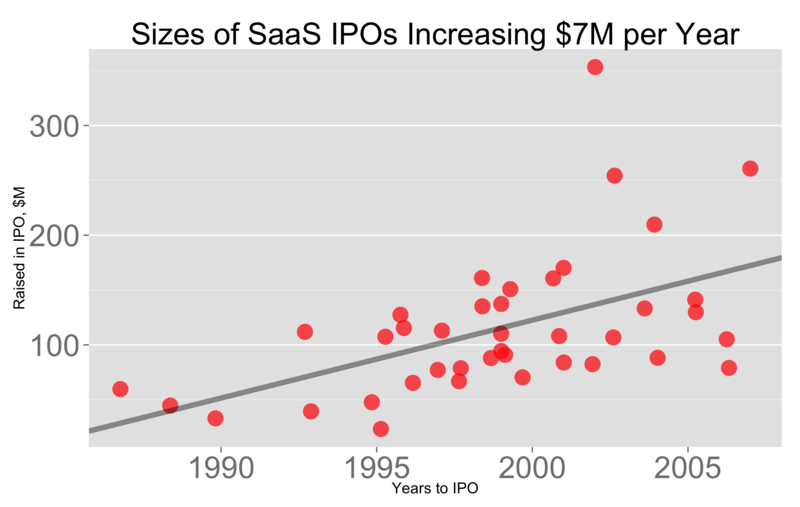 Despite the decrease in time, the average size of a SaaS IPO has been steadily increasing by $7M per year. Some part of this is due to multiple expansion, mentioned above. Other hypotheses include startups leveraging more efficient sales channels (Veeva and Salesforce for example), more venture dollars raised to finance growth or even a changing customer base more receptive to SaaS offerings. 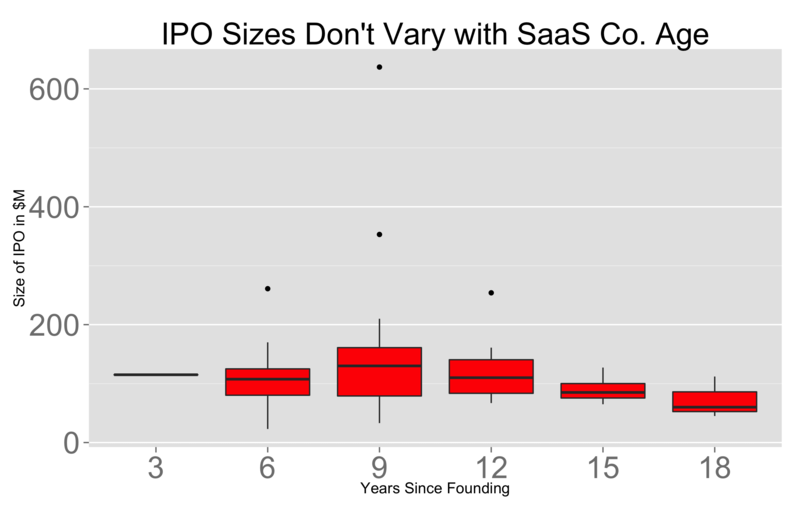 Curiously enough, the average size of an IPO doesn’t change with age. I wondered if some companies waited a few extra years to raise larger IPOs, but the data doesn’t show that to be the case. The median offering size is statistically equivalent over quite a range times. For a boxplot showing this distribution, click here. All in all, there’s never been a better time to start a SaaS company or take one public. Valuation multiples are healthy, growth rates are strong and the time to IPO is decreasing. Quite an exciting time to be a SaaS entrepreneur!